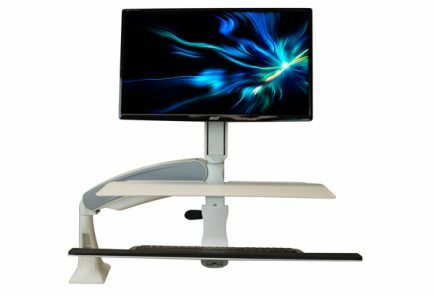 A decent desktop riser when evaluated on its own, but severely under-featured and overpriced when compared to other items in the category. Sturdy and with an excellent range of adjustment, the Taskmate Go has the same silhouette of some of our favorite risers. The keyboard tray comes with an attached swivelling mouse pad, and can also incline slightly – both very good features to have. The lever-locking height adjustment is easy to use and reliable. The lever locking-height adjustment is also pretty loud. No true secondary adjustment for monitor height, or at least no easy adjustment. A “v-shaped” base allows the central column to rock much more than we’d like. Loses out to better designed competitors on price. Our first look over the Taskmate Go 6300 was a positive one. The product follows a design scheme that we've become all too familiar with – a large central column with a pair of height-adjustable platforms attached. We’ve seen a few different mechanisms to ensure that those platforms move when you want them to, and stay put when you don’t. Instead of knob-adjust brakes (like those on the Kangaroo), or a countertension system (as on the Ergotron WorkFit-S), HealthPostures chose to go with a lever-lock system. It’s easy to use, and very effectively locks the adjustable platform into place. However, sound-sensitive coworkers may react poorly to the noise the Taskmate emits while clicking into position, which is reminiscent of a medieval trebuchet. To be fair the VariDesk exhibits a similar "spring-loaded clang" when being adjusted. All well and good, but we encountered some more serious deficiencies while evaluating the Taskmate’s other components. Take a peek at the monitor mount for the Taskmate, and you’ll see it’s not much more than a pegboard. We weren’t exactly impressed when we saw this, and subsequent testing showed that we had good reason to be concerned. 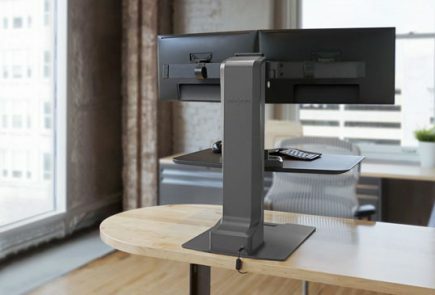 The Taskmate doesn’t have a truly adjustable monitor mount – and that’s a huge problem. Why? 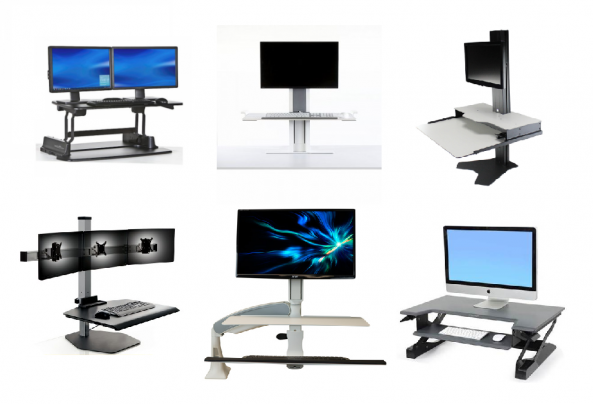 The ergonomic distance between monitor and keyboard is different for a standing worker than it is for a sitting worker. Failing to compensate for that change while switching postures can hammer you physically. 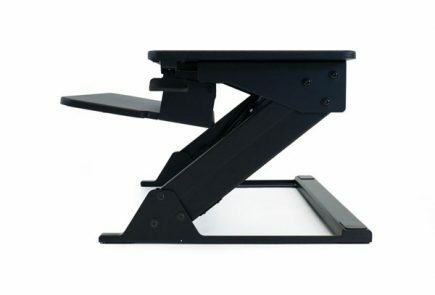 Given that, we always strongly recommend finding a riser with a second degree of adjustment – either a mobile monitor mount, or an adjustable keyboard tray. The Go has neither of those features: instead, a user has to physically take her monitors off, and muscle them up to a proper height. Either that or accept the consequences of an improperly configured workstation. A fundamentally unsteady base compounds this problem. While the skeletal, v-shaped mount of the Taskmate certainly looks much nicer than the ungainly clamp we’ve seen on other risers, it just doesn’t provide enough support. Those thin strips of metal are prone to flexing, especially while the riser is in a raised-height position. Given these deficiencies, we can’t really recommend the Taskmate Go, especially given that vastly superior products have it beaten handily in terms of price. We have high hopes for future offerings from HealthPostures – they’re a solid company, and we liked their powered Executive riser – but it’s best to give this lightweight riser a miss. The Taskmate 6300 comes with a five year warranty.